With a population of over 72,000 and growing, it's the second largest city on the Island. Originally the site of 5 Indian villages, the Hudson's Bay Company established a settlement here in 1852 to work the coal deposits, and became the largest coal producer on the Pacific Coast. During the summer, at noon each day, the Bastion Guards (originally formed to defend against possible Indian raids), wearing 19th-century uniforms, fire the old cannon. A scenic waterfront promenade overlooks the harbor in the downtown area, offering a great view. 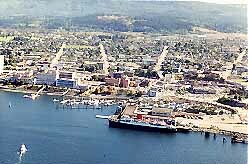 An important deep sea port, Nanaimo's harbor is always a hub of activity; good fishing for salmon, cod and red snapper. Nanaimo's big day is the third Sunday in July, the date for the 30-mile Bathtub Race. Formerly run across the Strait of Georgia, the race now begins and ends in Nanaimo and attracted 8000 to 10000 happy spectators in 1997.